Alright, here\'s my 10 gallon. Some of the plants haven\'t quite fully recovered from the store and most of the bulbs are just starting to grow I wanted a more natural look while still accenting the colors of the black neons and a future honey gourami and this is what I got. \nLighting: standard 19W florescent lights that came with the All Glass hood. \nInhabitants: 2 black neons. Soon to be more! \nPlants: Amazon swords (will get too big for tank), red tiger lotus (I think, will also get too big for tank), windelov java fern on driftwood, vallesnaria (not doing well, too high of maintenence for starters), aponogeton, and hornwort. \nand yah, maybe after this message I successfully attached the beta\'s I have. thanks for the compliments. I probably have to change my blue one to a taller container because there\'s only about 2 glasses of water in that one and I now feel bad. \nI also have some new pics and I think they\'re cool too but I have to borrow the digit camera again to take pictures of them. so it\'s a "coming soon" stuff. \nand thank you for the link. nice information and picturesssssssss. We are definitely international, but here\'s some background. \nIt would be great if you put all those various betta pics into this thread. I think they are great shots and I love the artistic effect. Here\'s my 10 gallon A couple things are different right now since I\'m always changing stuff. \nyou mentioned that long finned serpae would be good for a smaller tank, is this the same as a serpae tetra? cause i saw some nice ones down at the LFS. \r\n	"don\'t you think that idea is a little half-baked?" Hello everyone! I am very happy to have found this website. Thanks Tim. I am relativley new to the hobby. Very addictive! But you all already know that right? I started with a 10 gallon tank that cycled with a few whiteclouds (the little buggers are still big and strong0. 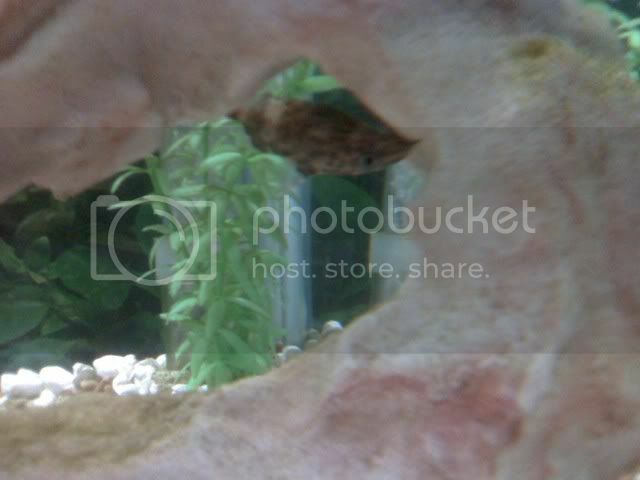 I also have 2 creamsicle lyretail mollies (males), 3 female bettas, and two green cory\'s. A month or so ago I got a small bookshelf aquarium 6gallons or so (is there a way to tell how many gallons the tank is by it\'s measurements?). I have a male crowtail betta (I call him curly cuz one of his little fin parts seems to be perminatly curly. His tank mates are one leapard cory (just recently read that they are happies in groups...should I move him to the 10 gallon tanks? I know I\'m kind pushing the "overstock" button on that thank...what to do..what to do...) and also 3 silver tip tetras...again..I read they are happiest in groups of 5 or more...contimplating getting a couple more...but don\'t want to over stock my 6 gal. Decisions...decisions. \n1.) 6 gal(?) tank. There really are fish in there. \n2.) Bettas are hard to photograph!...a couple tetras in the background. \n4.) Mollies are the only ones who like the cameara. \n5.) YOu can see a few bettas in this one. (females). \nOh..why do the attachments have to be soo small? If I save them in different formats would they be bigger? \nAll for now. Sorry...you\'ll soon learn I\'m long winded. oops. Wow, everyone\'s tanks look lovely on here. This is a great idea for helping people get their creative juices flowing for tank decor! \nI have a 10 gallon that I am working on decorating that houses my fancy guppies and a Cory Catfish named Niblet. I think after seeing these that I should add more fake plants (I do fake b/c I\'m in college and transport the tank home over breaks, et cetera and I worry real plants would be too difficult). The gravel is just aquarium gravel from a pet store, a more natural color with browns/tans. There are some larger stones on top (as you can see I\'m sure!). I had just added the driftwood piece in the center when the picture was taken (hence the bubbles). It\'s been great for the baby guppies to hide in. \nIn three words I can sum up everything I\'ve learned about life: it goes on. Hi guys those tanks look great. I love the Guppy fairy wonderland and the fighter tank underneath it. \nI now have a good reason to upgrade my fighters tank as the 5 litre bowl he was in is now broken. Apparently when cleaning them you shouldn\'t bounce them, they don\'t bounce back . So here\'s Ginsu\'s temp home. I hope you like it. It took hours to make up the decor . My Eclipse 5 Gallon Hex with 1 male Fancy Guppy. It needs more decor, I know...but thats it as of right now. Here\'s my 12 gallon. It\'s on the "stone) fireplace mantle backed by a mirror. In the lower left at the back is my hilly. since this picture I\'ve added some smooth river rocks to the bottom for him. hiya i have a 54 litre aquarium which i only have a picture of when empty unfortunately ill take a new one soon. the fish i have in it now are an angel, 4 diamond tetras, 1 peppered cory, 1 ram, and a red-spotted plec. Here is my 10 gallon with my mollies. You can see the smallest fry at the bottom the older fry in the middle and my oldest molly in the top. I made the background myself, of my family and I. Some of those pictures are old but that is what i look like. ive just set up a new 60 litre tank, i just started cycling it yesterday. i think the plants dont look right, what do you think of it let me know please. My 10 gal. Cory tank, 10 gal. Gourami tank, 10 gal. nursery(now growing Yellow Labs), and my 5 gal. Betta tank....I really need to get backgrounds for these soon! Here is my 10 gallon Betta Tank with 1 Red Betta and two oto cats. \nJust to share the setup of my new nano tank for kitchen table top. 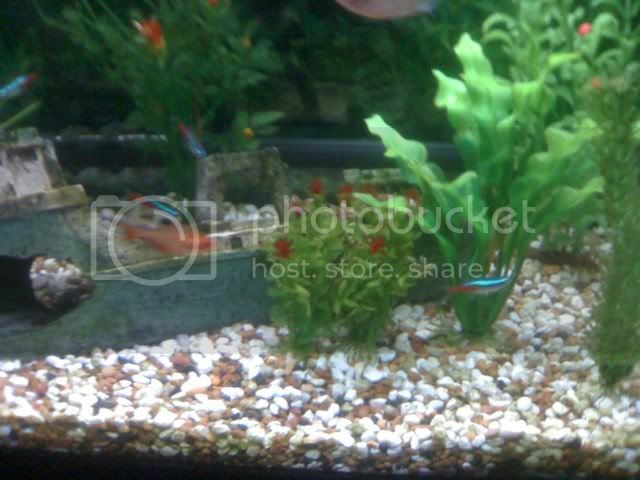 \nFaunas: 6 Cherry barbs and 4 Neon tetras and 8 cherry shrimps. \nTank size: 30cm x 18cm x 24 cm.H. approx. 3.5 gal. \nPlants: Glossostigma, hairgrass, ruffle and crypt wendtii. \nShare with my existing 15 gal. tank. At first was designed to keep high grade shrimps and later found not successful with them. After that, used it to keep corydoras fishes and golden algae eater, and now shifted all the fishes out to another tank, add in new lapis sand on top of the old gravel and hope to get some nice fishes from LFS. But I post pictures of the tank here to see what idea of fishes you can suggest for me. LOL. Tank size 24" x 12" x 12" H. Thanks in advance. 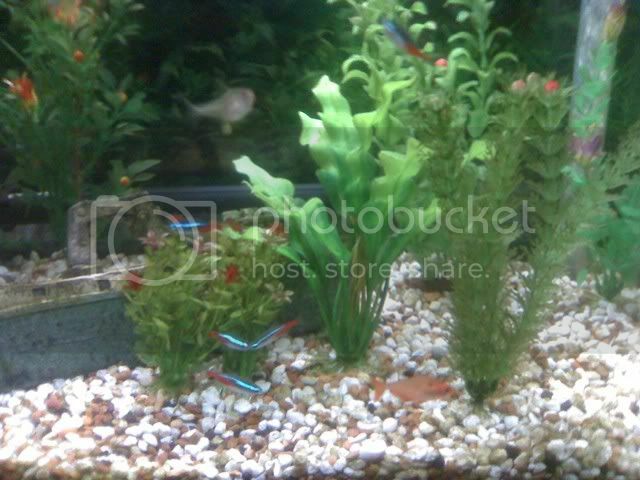 \nthe tank with the blue gravel houses a pair of mystic blue swordtails and three Kuhli loaches. The plants in this tank are wisteria on the left side and anubias in the right front corner. \nThe 20 gallon tank (with the Roman styled column in the middle) is currently cycling, and will have some plants in it on the 15th. I plan to use this for guppies (my wife wants these) and cherry red shrimp. For plants I will put some java moss or the like, wisteria (one start in the tank now right hand side), Swords of somesort (maybe a different variety than the Amazon sword), and maybe some grasses. The only critter in this tank now is a single malaysian snail. \r\n16-gal bowfront - there are 3 fry visible here with my two platies. (Number 4 is hiding...) This is after I made an attempt to clean the algae yesterday - my decor and plant leaves were almost completely black! \r\n14-gal rectangular - new home for my molly with attitude. lol, no i had the gourami first.he is actually the more aggressive of my fish for some reason.but for the most part they get along well. when i saw the bichirs i couldn\'t resist buying them.thank you.